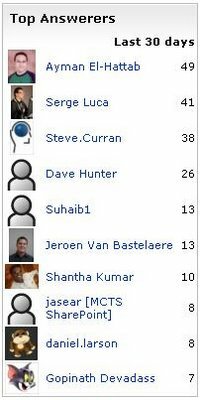 I forgot to announce that I was awarded the third star @ MSDN forums two weeks ago. For those who don’t know, MSDN and Technet forums have a star based recognition system for how many answers you provide and how much you share to the community. I would like to announce that I’ll be speaking at Egypt SharePoint User Group on June, 16th with Michael Noel. The event will be held at ITWorx Egypt Roof Cafeteria, Nasr City – Free Zone. Incorporate High Availability, Disaster Recovery, and Virtualization into an existing SharePoint environment. Michael Noel is an internationally recognized technology expert, bestselling author, and well known public speaker on a broad range of IT topics. He has authored several major best-selling industry books that have been translated into over a dozen languages. Significant titles include SharePoint 2007 Unleashed, Teach Yourself SharePoint 2007 in 10 Minutes, Windows Server 2008 Unleashed, ISA Server 2006 Unleashed, Exchange Server 2007 Unleashed, and many more. Currently a partner at Convergent Computing (www.cco.com) in the San Francisco Bay Area, Michael’s writings and extensive public speaking experience across six continents leverage his real-world expertise helping organizations realize business value from Information Technology infrastructure. Content types are incredibly cool and fundamental to how SharePoint works with Data and Information. In this session we’ll explore the power of custom content types development and see how we can use them for customizing the visual appearance, introducing new behaviors and much MORE ! Note: due to limited seats you have to register and present the registeration mail at the event. Just wanted to inform you that I’ll be active ( Hopefully ) in the next period @ MSDN and TECHNET Forums, I’ve been awarded a star a couple of months ago and I’m seeking the third one. 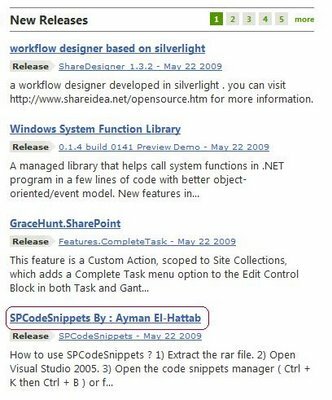 Here is a list of my prvious threads : http://social.technet.microsoft.com/Forums/en-US/user/threads?user=Ayman%20El-Hattab . And here is a link to my profile there : http://social.technet.microsoft.com/Profile/en-US/?user=Ayman%20El-Hattab. Join me there if you need to ask me or any of the experts there any questions , I’ll be waiting for you @ SharePoint : Development And Programming Forum. Q : We just tested our sharepoint branding in IE8, but it’s totally messed up!what’s wrong with IE8 ? ?Did anybody encounter this before ? A : Generally, there are two choices for rendering mode, “standards” mode and “quirks” mode. In “standards” mode, a modern browser will do its best to render the document according to the W3C recommendations, even if it leads to unexpected results. In “quirks” mode, a modern browser will try to handle an (x)HTML document like older browsers from the mid-to late ’90s did. It will do its best to imitate the parsing, rendering, and bugs of earlier browsers when encountering sloppy or invalid code authoring. And, it will display those quirky pages in the same way as those earlier browsers do. So how does a browser decide whether it should use “standards” mode or “quirks” mode? Why, by examining the doctype, or lack thereof on the web page. If IE8 sees a valid DocType declared it will attempt to render a site in IE8 Standards Mode. Master pages like default.master that do not have a doctype declared will render automatically in IE8 in quirks mode. However if you create a custom master page and add a doctype IE8 will try to render the page in IE8 standards mode which will cause some problems like in showing SharePoint dynamic menus . So if you want to add a DocType, you should add the followint Meta Tag < meta equiv=”X-UA-Compatible” content=”IE=EmulateIE7″> , this will render your page like IE7 Mode.